Vladimir Putin is a Russian politician and former KGB intelligence officer currently serving as President of Russia. Elected to his current and fourth presidential term in May 2018, Putin has led the Russian Federation as either its prime minister, acting president, or president since 1999. Long considered an equal of the President of the United States in holding one of the world’s most powerful public offices, Putin has aggressively exerted Russia’s influence and political policy around the world. Known for: Russian Prime Minister and Acting President of Russia, 1999 to 2000; President of Russia 2000 to 2008 and 2012 to present; Russian Prime Minister 2008 to 2012. While attending elementary and high school, Putin took up judo in hopes of emulating the Soviet intelligence officers he saw in the movies. Today, he holds a black belt in judo and is a national master in the similar Russian martial art of sambo. He also studied German at Saint Petersburg High School, and speaks the language fluently today. After initially considering a career in law, Putin was recruited into the KGB (the Committee for State Security) in 1975. He served as a foreign counter-intelligence officer for 15 years, spending the last six in Dresden, East Germany. After leaving the KGB in 1991 with the rank of lieutenant colonel, he returned to Russia where he was in charge of the external affairs of Leningrad State University. It was here that Putin became an advisor to his former tutor Anatoly Sobchak, who had just become Saint Petersburg’s first freely-elected mayor. Gaining a reputation as an effective politician, Putin quickly rose to the position of first deputy mayor of Saint Petersburg in 1994. After moving to Moscow in 1996, Putin joined the administrative staff of Russia’s first president Boris Yeltsin. Recognizing Putin as a rising star, Yeltsin appointed him director of the Federal Security Service (FSB)—the post-communism version of the KGB—and secretary of the influential Security Council. On August 9, 1999, Yeltsin appointed him as acting prime minister. On August 16, the Russian Federation’s legislature, the State Duma, voted to confirm Putin’s appointment as prime minister. The day Yeltsin first appointed him, Putin announced his intention to seek the presidency in the 2000 national election. While he was largely unknown at the time, Putin’s public popularity soared when, as prime minister, he orchestrated a military operation that succeeded resolving the Second Chechen War, an armed conflict in the Russian-held territory of Chechnya between Russian troops and secessionist rebels of the unrecognized Chechen Republic of Ichkeria, fought between August 1999 and April 2009. When Boris Yeltsin unexpectedly resigned on December 31, 1999, under suspicion of bribery and corruption, the Constitution of Russia made Putin acting President of the Russian Federation. Later the same day, he issued a presidential decree protecting Yeltsin and his relatives from prosecution for any crimes they might have committed. While the next regular Russian presidential election was scheduled for June 2000, Yeltsin’s resignation made it necessary to hold the election within three months, on March 26, 2000. At first far behind his opponents, Putin’s law-and-order platform and decisive handling of the Second Chechen War as acting president soon pushed his popularity beyond that of his rivals. On March 26, 2000, Putin was elected to his first of three terms as President of the Russian Federation winning 53 percent of the vote. Shortly after his inauguration on May 7, 2000, Putin faced the first challenge to his popularity over claims that he had mishandled his response to the Kursk submarine disaster. He was widely criticized for his refusal to return from vacation and visit the scene for over two weeks. When asked on the Larry King Live television show what had happened to the Kursk, Putin’s two-word reply, “It sank,” was widely criticized for its perceived cynicism in the face of tragedy. October 23, 2002, as many as 50 armed Chechens, claiming allegiance to the Chechnya Islamist separatist movement, took 850 people hostage in Moscow’s Dubrovka Theater. An estimated 170 people died in the controversial special-forces gas attack that ended the crisis. 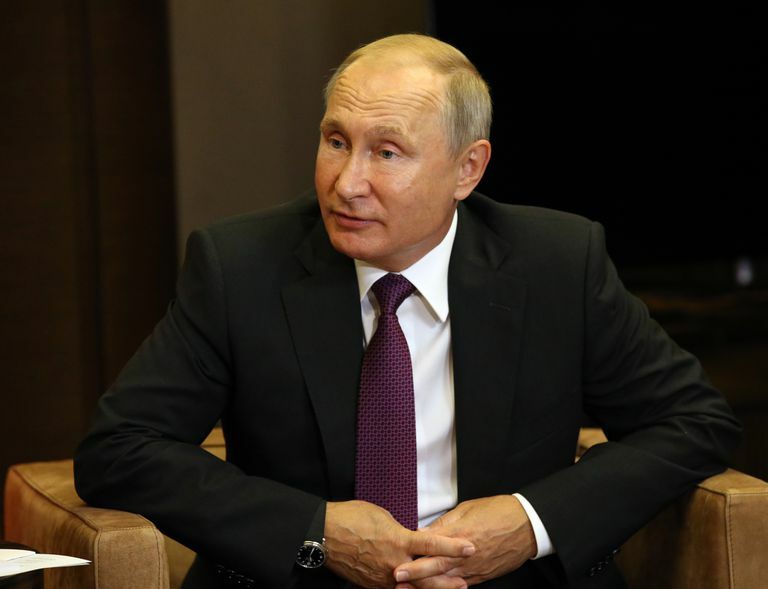 While the press suggested that Putin’s heavy-handed response to the attack would damage his popularity, polls showed over 85 percent of Russians approved of his actions. Less than a week after the Dubrovka Theater attack, Putting clamped down even harder on the Chechen separatists, canceling previously announced plans to withdraw 80,000 Russian troops from Chechnya and promising to take “measures adequate to the threat” in response to future terrorist attacks. In November, Putin directed Defense Minister Sergei Ivanov to order sweeping attacks against Chechen separatists throughout the breakaway republic. Putin’s harsh military policies succeeded in at least stabilizing the situation in Chechnya. In 2003, the Chechen people voted to adopt a new constitution confirming that the Republic of Chechnya would remain a part of Russia while retaining its political autonomy. Though Putin’s actions greatly diminished the Chechen rebel movement, they failed to end the Second Chechen War, and sporadic rebel attacks continued in the northern Caucasus region. During the majority of his first term, Putin concentrated on improving the failing Russian economy, in part by negotiating a “grand bargain” with the Russian business oligarchs who had controlled the nation’s wealth since the dissolution of the Soviet Union in the early 1990s. Under the bargain, the oligarchs would retain most of their power, in return for supporting—and cooperating with—Putin’s government. According to financial observers at the time, Putin made it clear to the oligarchs that they would prosper if they played by the Kremlin rules. Indeed, Radio Free Europe reported in 2005 that the number of Russian business tycoons had greatly increased during Putin’s time in power, often aided by their personal relationships with him. On March 14, 2004, Putin was easily re-elected to the presidency, this time winning 71 percent of the vote. During his second term as president, Putin focused on undoing the social and economic damage suffered by the Russian people during the collapse and dissolution of the Soviet Union, an event he called “the greatest geopolitical catastrophe of the Twentieth Century.” In 2005, he launched the National Priority Projects designed to improve health care, education, housing, and agriculture in Russia. On October 7, 2006—Putin’s birthday— Anna Politkovskaya, a journalist and human rights activist, who as a frequent critic of Putin and had exposed corruption in the Russian Army and cases of its improper conduct in the Chechnya conflict, was shot to death as she entered the lobby of her apartment building. While Politkovskaya’s killer was never identified, her death brought criticism that Putin’s promise to protect the newly-independent Russian media had been no more than political rhetoric. Putin commented that Politkovskaya’s death had caused him more problems than anything she had ever written about him. In 2007, Other Russia, a group opposed to Putin led by former world chess champion Garry Kasparov, organized a series of “Dissenters’ Marches” to protest Putin’s policies and practices. Marches in several cities resulted in the arrests of some 150 protestors who tried to penetrate police lines. In the December 2007 elections, the equivalent of the U.S. mid-term congressional election, Putin’s United Russia party easily retained control of the State Duma, indicating the Russian people’s continued support for him and his policies. The democratic legitimacy of the election was questioned, however. While some 400 foreign election monitors stationed at polling places stated that the election process itself had not been rigged, the Russian media’s coverage had clearly favored candidates of United Russia. Both the Organization for Security and Co-operation in Europe and the Parliamentary Assembly of the Council of Europe concluded that the elections were unfair and called on the Kremlin to investigate alleged violations. A Kremlin-appointed election commission concluded that not only had the election been fair, but it had also proven the “stability” of the Russian political system. With Putin barred by the Russian Constitution from seeking a third consecutive presidential term, Deputy Prime Minister Dmitry Medvedev was elected president. However, on May 8, 2008, the day after Medvedev’s inauguration, Putin was appointed Prime Minister of Russia. Under the Russian system of government, the president and the prime minister share responsibilities as the head of state and head of the government, respectively. Thus, as prime minister, Putin retained his dominance over the country’s political system. In September 2001, Medvedev proposed to the United Russia Congress in Moscow, that Putin should run for the presidency again in 2012, an offer Putin happily accepted. On March 4, 2012, Putin won the presidency for a third time with 64 percent of the vote. Amid public protests and accusations that he had rigged the election, he was inaugurated on May 7, 2012, immediately appointing former President Medvedev as prime minister. After successfully quelling protests against the election process, often by having marchers jailed, Putin proceeded to make sweeping—if controversial—changes to Russia’s domestic and foreign policy. In December 2012, Putin signed a law prohibiting the adoption of Russian children by U.S. citizens. Intended to ease the adoption of Russian orphans by Russian citizens, the law stirred international criticism, especially in the United States, where as many as 50 Russian children in the final stages of adoption were left in legal limbo. The following year, Putin again strained his relationship with the U.S. by granting asylum to Edward Snowden, who remains wanted in the United States for leaking classified information he gathered as a contractor for the National Security Agency on the WikiLeaks website. In response, U.S. President Barack Obama canceled a long-planned August 2013 meeting with Putin. Also in 2013, Putin issued a set of highly controversial anti-gay laws outlawing gay couples from adopting children in Russia and banning the dissemination of material promoting or describing “nontraditional” sexual relationships to minors. The laws brought worldwide protests from both the LGBT and straight communities. In December 2017, Putin announced he would seek a six-year—rather than four-year—term as president in July, running this time as an independent candidate, cutting his old ties with the United Russia party. After a bomb exploded in a crowded Saint Petersburg food market on December 27, injuring dozens of people, Putin revived his popular “tough on terror” tone just before the election. He stated that he had ordered Federal Security Service officers to “take no prisoners” when dealing with terrorists. In his annual address to the Duma in March 2018, just days before the election, Putin claimed that the Russian military had perfected nuclear missiles with “unlimited range” that would render NATO anti-missile systems “completely worthless.” While U.S. officials expressed doubts about their reality, Putin’s claims and saber-rattling tone ratcheted up tensions with the West but nurtured renewed feelings of national pride among Russian voters. On March 18, 2018, Putin was easily elected to a fourth term as President of Russia, winning more than 76 percent of the vote in an election that saw 67 percent of all eligible voters cast ballots. Despite the opposition to his leadership that had surfaced during his third term, his closest competitor in the election garnered only 13 percent of the vote. Shortly after officially taking office on May 7, Putin announced that in compliance with the Russian Constitution, he would not seek reelection in 2024. On July 16, 2018, Putin met with U.S. President Donald Trump in Helsinki, Finland, in what was called the first of a series of meetings between the two world leaders. While no official details of their private 90-minute meeting were published, Putin and Trump would later reveal in press conferences that they had discussed the Syrian civil war and its threat to the safety of Israel, the Russian annexation of Crimea, and the extension of the START nuclear weapons reduction treaty. During Putin’s third presidential term, allegations arose in the United States that the Russian government had interfered in the 2016 U.S. presidential election. A combined U.S. intelligence community report released in January 2017 found “high confidence” that Putin himself had ordered a media-based “influence campaign” intended to harm the American public’s perception of Democratic candidate Hillary Clinton, thus improving the electoral chances of eventual election winner, Republican Donald Trump. In addition, the U.S. Federal Bureau of Investigation (FBI) is investigating whether officials of the Trump campaign organization colluded with high ranking Russian officials to influence the election. While both Putin and Trump have repeatedly denied the allegations, the social media website Facebook admitted in October 2017 that political ads purchased by Russian organizations had been seen by at least 126 million Americans during the weeks leading up to the election. Vladimir Putin married Lyudmila Shkrebneva on July 28, 1983. From 1985 to 1990, the couple lived in East Germany where they gave birth to their two daughters, Mariya Putina and Yekaterina Putina. On June 6, 2013, Putin announced the end of the marriage. Their divorce became official on April 1, 2014, according to the Kremlin. An avid outdoorsman, Putin publicly promotes sports, including skiing, cycling, fishing, and horseback riding as a healthy way of life for the Russian people. While some say he may be the world’s wealthiest man, Vladimir Putin’s exact net worth is not known. According to the Kremlin, the President of the Russian Federation is paid the U.S. equivalent of about $112,000 per year and is provided with an 800-square foot apartment as an official residence. However, independent Russian and U.S. financial experts have estimated Putin’s combined net worth at from $70 billion to as much as $200 billion. While his spokespersons have repeatedly denied allegations that Putin controls a hidden fortune, critics in Russia and elsewhere remain convinced that he has skillfully used the influence of his nearly 20-years in power to acquire massive wealth. A member of the Russian Orthodox Church, Putin recalls the time his mother gave him his baptismal cross, telling him to get it blessed by a Bishop and wear it for his safety. “I did as she said and then put the cross around my neck. I have never taken it off since,” he once recalled. Bohlen, Celestine (2000). “YELTSIN RESIGNS: THE OVERVIEW; Yeltsin Resigns, Naming Putin as Acting President To Run in March Election.” The New York Times. Sakwa, Richard (2007). “Putin : Russia's Choice (2nd ed. ).” Abingdon, Oxon: Routledge. ISBN 9780415407656. Judah, Ben (2015). “Fragile Empire: How Russia Fell in and Out of Love with Vladimir Putin.” Yale University Press. ISBN 978-0300205220.